After Martha's post, I drove out to our Mesa campus and checked out the "EBM and Manual Medicine book" -- it is AWESOME. It effectively combines anatomy, pathophys, research, controversy, and technique in one manual. As a first edition, it has some flaws, but I think it does what the FOM was meant to do, in a much more user-friendly arrangement. It's perfect for teaching -- or anything that requires presenting manual medicine in a credible, communicable way. Also, It comes with a DVD that outlines many of the techniques described in the book. I'm purchasing a personal copy ASAP. 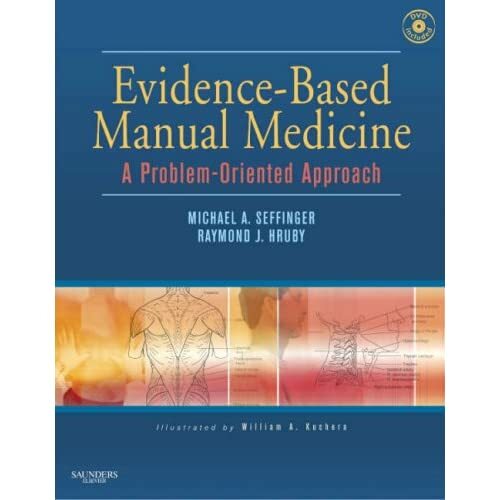 The book is Evidence-Based Manual Medicine by Michael Seffinger, DO and Raymond Hruby, DO, illustrated by Dr. Kuchera. I'll also be adding this to the Recommended Reading page on the site with the next update. Nice to "meet" you and welcome on board!! I can answer your question about why we aren't taught OMT treatments for every disease yet there seems to be a pharm treatment (albeit, even the pharm treatments are sometimes ridiculous by just throwing steroids at someone, etc). Research. What I'm about to say is my pure conjecture, which should not hold any weight. Actually, I need to read more about the history of medicine/physiology/pathology. It is my belief the original research deducing basic physiology was elegant yet simple, reproducible and irrefutable. Drugs may have been used to help prove a hypothesis, but they weren't used in excess. Concurrently, drugs were being used clinically without a clear rationale. For both of these reasons further research revolved more and more around drugs: how they changed the biochemical make-up of a disease model, their clinical effect, etc. Drugs are handy because you can do a well-controlled study where you have 2 parallel systems, the only difference being the addition of a drug. A researcher's dream. Not to mention the investment of pharm agencies in the funding of said research. So, our instinct agrees with Dr. Still's idea that the body contains all the ingredients to heal itself, however, our ethical/societal obligation is to "buy" into the pharmacological approach to treatment of disease because that is how society says we should operate. If we don't follow standard recommendations, we could lose our licenses. Another influence in our education are the scientific sticklers (PhD professors) who blindly believe in the scientific method and EBM, shunning most OMT (especially cranial) for conditions other than pain syndromes because they lack clinical experience to valid the non-scientific ways of healing. Thus, these PhD folks want us to maintain our scientific credibility, which I can respect, however they limit us by not seeing what's possible. That leaves us with the clinicians to teach about the possibilities of OMT in the setting of disease, but how many of them are trained appropriately? It really is a conundrum, which is why I am so thankful to people like Jonathan and Kelly and yourself who are as passionate about the topic as I am. The Osteopathic Integration website is a great start to give students that speck of hope regarding what MIGHT be possibility with OMT for treatment of disease. There are some excellent texts that SHOULD be cited in our course work, but those god damned PhD people believe that if students are interested, they would fine the resources theirselves. I about went through the roof when one professor told me that. Luckily, a DO stepped in and said she thought my request was reasonable. On the topic of resources, have any of you heard that Ray Hruby and Mickey Seffenger recently wrote a book on EBM OMM? Welcome to the official blog for osteopathicintegration.org ! While we're frequently updating the site, we realized that there was no good way to point out the new content we receive. From now on, all site news, updates, and announcements will be posted here. For easy updates, subscribe to our RSS feed. Kelly, Martha, and I would also like to welcome our newest team member -- Erik Gulbrandsen, OMS III. Erik is finishing up his third year at KCOM and currently rotating in Carbondale, Illinois. Erik brings many talents to the team; he's an accomplished, self-trained web developer, is drawn to service, and hopes to create a model for continuity clinics in osteopathic med school curricula. We also have Erik to thank for the creation of this blog. Welcome, Erik!